The recording of today's webinar, "Exploring AncestryDNA’s New Genetic Communities" by Blaine Bettinger, Ph.D., J.D. is now available to view at www.FamilyTreeWebinars.com for free for a limited time. AncestryDNA released a new tool called Genetic Communities which identifies regions from which our ancestors came from roughly 200 years ago. These communities provide you with insight into your ancestry, and provide a new method to characterize and organize some of those mysterious matches! Together we’ll look at this new tool, how it works, and how you can use it. If you could not make it to the live event or just want to watch it again, the 1 hour 29 minute recording of "Exploring AncestryDNA’s New Genetic Communities" is now available to view in our webinar library for free for a limited time. Or watch it at your convenience with an annual or monthly webinar membership. Discover the answers to your family history mysteries using the most-cutting edge tool available. This plain-English guide is a one-stop resource for how to use DNA testing for genealogy. Inside, you'll find guidance on what DNA tests are available, plus the methodologies and pros and cons of the three major testing companies and advice on choosing the right test to answer your specific genealogy questions. And once you've taken a DNA test, this guide will demystify the often-overwhelming subject and explain how to interpret DNA test results, including how to understand ethnicity estimates and haplogroup designations, navigate suggested cousin matches, and use third-party tools like GEDmatch to further analyze your data. To give you a holistic view of genetic testing for ancestry, the book also discusses the ethics and future of genetic genealogy, as well as how adoptees and others who know little about their ancestry can especially benefit from DNA testing. Whether you've just heard of DNA testing or you've tested at all three major companies, this guide will give you the tools you need to unpuzzle your DNA and discover what it can tell you about your family tree. The recording of today's webinar, "Introduction to Quaker Genealogy Research" by Craig R. Scott, MA, CG, FUGA is now available to view at www.FamilyTreeWebinars.com for free for a limited time. This lecture examines how Quakers created records at the various types of meetings, be they Yearly, Quarterly or Monthly. It examines the types of records, their value to a researcher and where they can be found. If you could not make it to the live event or just want to watch it again, the 1 hour 30 minute recording of "Introduction to Quaker Genealogy Research" is now available to view in our webinar library for free for a limited time. Or watch it at your convenience with an annual or monthly webinar membership. Our Quaker Ancestors sets out to acquaint the researcher with the types of Quaker records that are available, the location of the records, and the proper and effective use of those records, guiding him through the pyramidal "meeting" structure to the records of birth, marriage, death, disownment, and removal awaiting him in record repositories across the country. The work begins with a short but essential history of the Quaker movement and a discussion of its organization and structure, particularly as it affects genealogical research. Later chapters describe Quaker migrations to and within America, the special types of records available for research, and the Berrys' very own methods for locating and using those records. In addition, there are chapters on record repositories and libraries with Quaker source material, non-Quaker repositories, and Quaker sources and repositories outside the U.S., together with a bibliography, maps of selected meeting locations, and a glossary of terms peculiar to the Society of Friends. This is indispensable for anyone tracing ancestors who were either birthright members of the Society or who became members through "convincement" or marriage. "[This book] is a must...Types of records, sources, how to read the record, bibliography--it's all here, succinctly and clearly organized." --FRIENDS JOURNAL (July 1988). "Anyone beginning research on a New York Quaker family will benefit from reading this guide..."--THE NEW YORK GENEALOGICAL AND BIOGRAPHICAL RECORD, Vol. 119, No. 2 (April 1988). "This work is indispensable for anyone researching Quaker ancestors." --NATIONAL GENEALOGICAL SOCIETY QUARTERLY, Vol. 75, No. 4 (December 1987). AncestryDNA is releasing a new tool called Genetic Communities which identifies regions from which our ancestors came from roughly 200 years ago. These communities provide you with insight into your ancestry, and provide a new method to characterize and organize some of those mysterious matches! Together we’ll look at this new tool, how it works, and how you can use it. Join us and Blaine Bettinger, Ph.D., J.D. for the live webinar Thursday, March 30, 2017 at 2pm Eastern U.S. Register today to reserve your virtual seat. Registration is free but space is limited to the first 1,000 people to join that day. Before joining, please visit www.java.com to ensure you have the latest version of Java which our webinar software requires. When you join, if you receive a message that the webinar is full, you know we've reached the 1,000 limit, so we invite you to view the recording which should be published to the webinar archives within an hour or two of the event's conclusion. Blaine frequently authors articles and gives presentations to educate others about the use of DNA to explore their ancestry. 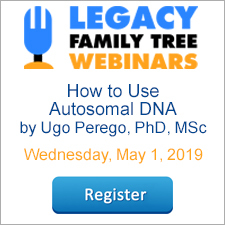 He is an instructor for genetic genealogy courses at the Institute of Genealogy and Historical Research (IGHR), Salt Lake Institute of Genealogy (SLIG), Genealogical Research Institute of Pittsburgh (GRIP), Virtual Institute of Genealogical Research, and Family Tree University. Blaine was also recently elected to the New York Genealogical and Biographical Society's Board of Trustees, and graduated from ProGen Study Group 21 in 2015. Join us and Craig Scott, MA, CG, FUGA for the live webinar Wednesday, March 29, 2017 at 2pm Eastern U.S. Register today to reserve your virtual seat. Registration is free but space is limited to the first 1,000 people to join that day. Before joining, please visit www.java.com to ensure you have the latest version of Java which our webinar software requires. When you join, if you receive a message that the webinar is full, you know we've reached the 1,000 limit, so we invite you to view the recording which should be published to the webinar archives within an hour or two of the event's conclusion. Craig Roberts Scott, MA, CG, FUGA is the author of The ‘Lost Pensions’: Settled Accounts of the Act of 6 April 1838 (Revised) and Records of the Accounting Officers of the Department of the Treasury, Inventory 14 (Revised). His most recent work is Understanding Revolutionary War and Invalid Pension Ledgers, 1818 – 1872, and the Payment Vouchers They Represent. He has authored seventeen books and several articles in the National Genealogical Society Quarterly, Family Chronicle and other genealogical publications. He is the President and CEO of Heritage Books, Inc., a genealogical publishing firm with over 5,300 titles in print. A professional genealogical and historical researcher for more than thirty years, he specializes in the records of the National Archives. He is a member of the Company of Military Historians on the editorial board of the National Genealogical Society Quarterly, and is a Director of the Association of Professional Genealogists. A faculty member for several years of the Institute of Genealogy and Historical Research, Samford University and the Salt Lake Institute of Genealogy, and recently the Genealogical Institute of Pittsburgh. He is the coordinator for the 3rd Annual Heritage Books Genealogical Conference and Cruise. He was awarded the Grahame T. Smallwood, Jr. Award in 2008 and UGA Silver Tray Award in 2009. He became a Fellow, Utah Genealogical Association in 2014. Those of us with westward migrating ancestors know how difficult it can be to trace people from their destination to their point of origin and vice versa. Even harder is finding the short stops along the way. Many genealogists have learned to use the United States Federal Census as a clue to migration. By looking at the birth location of children in a migrating family, we can often determine some of the stops a family made on their journey westward. The only challenge is that the Federal Census is only enumerated every 10 years. That's a big gap! New York played a big role in the lives of migrating families. Families who originated in New England often passed through New York, often stopping there for a few years before moving on. New York residents as well joined the migration west heading to Ohio and beyond. The challenge for many researchers is that the trail goes cold in New York. Vital records for most towns in New York state didn't start until the 1870s or later. If you have New England ancestors traveling west this come as a cold shock when you're used to vital records going back to the 1600s. Researching in New York is frustrating to say the least. All is not lost! You were on the right track when you used the U.S. Federal Census. While we may not have the advantage of New York vital records we do have the New York State Census. with the exception of a few counties. your ancestors are making stops within New York before moving on, this information is invaluable in tracing their steps. In addition, the three censuses indicate if a person owned land and the 1855 census mentions the “years resident in the town or city”. One of my "challenging" families is David Allen, his wife Mariah and their five kids. Between a common surname, transcription errors and migration I was fit to be tied tracking down this family. Then I found them in the 1855 New York State Census. The family was living in Volney, Fulton City, Oswego County, New York. David was listed as being born Jefferson County, New York according to the 1855 census. His wife Mariah (no maiden name yet discovered) was also born in Jefferson County about 1823. Their first child Henry was born about 1844 also in Jefferson County. The next child, Elizabeth, only one year younger that Henry, was born in Lewis County. A second daughter, Eleanor, was also born in Lewis County about 1849. The last child, Charles, only 11 months old was born in Oswego County. This tells me I can place the family in Jefferson County, New York at least up until 1844. They are in Lewis County from about 1845 to no later than 1854. They arrive in Oswego County in time for Charles’ birth around 1854. But there’s another clue. Column 13 – “Years resident in this city or town” – shows that the Allens have been in Volney, Fulton City for 2 years thus changing their likely arrival date in Oswego County to 1853. Column 20 – “Owners of land” – indicates that the Allen family did not own any land. This one census helped to clear up where the family started and where they stopped along the way in New York on the travel west. It gave me new locations to search for new records. By 1860 the family had moved on the Manlius, LaSalle County, Illinois. If your family traveled west during the mid-nineteenth century be sure to check the 1855, 1865 and 1875 New York State censuses (available on Ancestry.com) to find the clues to solving their migration mysteries. Unfortunately the Allen family remains a bit of a mystery for me. In the 1880 US Federal Census I find a David Allen, Maria Allen and son Charles Allen of appropriate ages in Faribault, Rice County, Minnesota. But I also find in a different 1880 census a John Slocumb, Elizabeth Slocumb and a widowed Maria Allen living in Port Huron, St. Clair County, Michigan. A Michigan marriage record indicates that a Libbie Maria Allen born in Lewis County, New York married John Slocumb in 1877. It will take a bit more digging to determine which is my Allen family! For help researching your New York ancestors see our New York series by expert Jane Wilcox in the Legacy library! Marian Pierre-Louis is the Social Media Marketing Manager for Legacy Family Tree. She is also a speaker, writer and the host of The Genealogy Professional podcast. Check out her webinars in the Legacy library. The recording of today's webinar, "Picture This: Images You Can Freely Use" by Judy G. Russell, JD, CG, CGL is now available to view at www.FamilyTreeWebinars.com/BCG for free for a limited time. There *are* images out there for use in your genealogical writing and speaking, free, and free from copyright. Learn to find and use them safely. If you could not make it to the live event or just want to watch it again, the 1 hour 27 minute recording of "Picture This: Images You Can Freely Use" is now available to view in our webinar library for free for a limited time. Or watch it at your convenience with an annual or monthly webinar membership. Genealogy is one of the most popular hobbies on the Internet. Genealogists love to share information about their families, and the very nature of the Internet fosters this practice. Probably because there is so much free information on the Web, many individuals have formed the false conclusion that "if it is on the Internet, anyone has a right to use the information as he/she sees fit." Despite the best of intentions, therefore, people will occasionally post content on a website or transmit it by e-mail without proper permission to do so. The issue of copyright is an aspect of genealogical research that may never have crossed your mind. As copyright lawyer Karen Kreider Gaunt puts it, "Numerous misconceptions surround even basic issues, such as work for hire, fair use, public domain, and publication. An author or genealogist operating under one of these misconceptions could find herself faced with serious misunderstandings, loss of business and clients, harm to reputation and goodwill, and, at worst, litigation in federal court." Ms. Gaunt's observations raise such fundamental questions as, "What is and what is not protected by copyright? What is in the public domain? Can I use information I find on the Internet? What constitutes fair use? When do I need to ask permission to use someone else's information, even if I quote it? And so on. What are your rights to your own genealogical discoveries? What can/should you do if someone has infringed on your copyright? When do you need to ask someone's permission to reprint their work? What are works in the public domain and how to find them? Can someone tape your lecture without your permission? In scarcely 100 pages, Carmack's Guide to Copyright and Contracts informs its readers about all aspects of copyright law. Each chapter in the book lays out a specific principle of copyright or contracts and then addresses the topic with situations specifically applicable to genealogists. Subjects covered in this fashion include: (1) Copyright Basics, (2) Fair Use, the Public Domain, and Seeking Permissions, (3) Illustrations, Images, Photographs, and Maps, (4) Works for Hire, (5) Collaboration Agreements, (6) Journals/Magazine Contracts, (7) Book contracts, (8) Electronic Contracts, and (9) Self-Publication Contracts. The author also provides an extremely useful glossary of terms found in contracts and matters of copyright. Rounding out the volume are an up-to-date bibliography; a resource directory of websites, links, and online articles; and an index to the book's contents. The recording of today's Board for Certification of Genealogists webinar, "Are You My Grandpa? Men of the Same Name" by Rebecca Whitman Koford, CG is now available to view at www.FamilyTreeWebinars.com/BCG for free for a limited time. This lecture reviews tactics for sorting our ancestors from other men or women of the same name in the same general time period and location. Several case studies show how these methods were effective. If you could not make it to the live event or just want to watch it again, the 1 hour 27 minute recording of "Are You My Grandpa? Men of the Same Name" is now available to view in our webinar library for free for a limited time. Or watch it at your convenience with an annual or monthly webinar membership. Join us and Judy G. Russell, JD, CG, CGL for the live webinar Wednesday, March 22, 2017 at 2pm Eastern U.S. Register today to reserve your virtual seat. Registration is free but space is limited to the first 1,000 people to join that day. Before joining, please visit www.java.com to ensure you have the latest version of Java which our webinar software requires. When you join, if you receive a message that the webinar is full, you know we've reached the 1,000 limit, so we invite you to view the recording which should be published to the webinar archives within an hour or two of the event's conclusion. In week two of my investigation into MyHeritage.com I will look into their Smart Matching technology. My initial post explained that just like I have experimented with other genealogy technologies, I felt it was time to give MyHeritage a solid look. Last week I described my experience of importing my Legacy-generated GEDCOM file into a new online tree. It went smoothly and I ended up with a private online tree. Well, mostly private. This "mostly private" part concerned me enough that I sent an email to the company to get clarification. They responded nearly immediately. What I learned from their response not only satisfied my concern, but gave me great confidence in and respect for their Smart Matching. I recognized one of the Smart Matches as being on my father-in-law's side. And since we're now living with him as we await the completion of the construction of our new house, maybe researching one of his ancestors will earn me some points. This Smart Match shows that the Fanny Maria Stewart in my tree could be the same person as a Fanny Maria Stewart in a potential relative's tree. If I determine that they are identical, it looks like I may be able to add a photograph and quite a bit of personal information that I did not previously have. Using Legacy's Relationship Calculator (Tools > Calculator > Relationship), I learned that Fanny is the wife of my father-in-law's great-granduncle. I love Legacy! Maybe MyHeritage has a similar relationship calculator. Good for them if they do! After my closer look, I can with confidence click on the orange Yes button. This took me to a Review Match screen where it compares what I have in my tree with what the other submitter has in their tree. Scrolling to the bottom, it compares our trees in graphical format. Clearly, there is a lot that I could add to my tree from theirs. Yet, any good genealogist knows to use content from others' trees as clues and not as evidence or conclusions. Regardless, it looks like they've done a lot of work and I love the many photographs they have. Before clicking on the Confirm Match button, I noticed an arrow to its right. Clicking on it popped up a message that I could save this submitter's data to my tree - "only New and Improved information will be saved." Like I just mentioned, I probably would not want to do that without verifying the data. Instead, I will just click on the Confirm Match button. Not knowing for sure what or if anything would automatically be added to my tree, I was relieved when I saw the next screen. Although I probably will not use its functionality, it has arrows pointing from the right side to the left side indicating that I could copy bits and pieces of information if I desired. 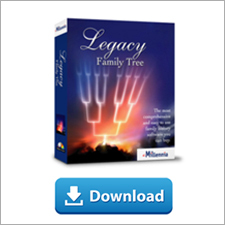 It's actually quite similar to the FamilySearch tools in our Legacy Family Tree software. At the very bottom it showed two photographs that I could add to my tree, and since I love photos of my ancestors, to see how it works, I clicked on the copy button. Pretty easy. Scrolling to the end, two buttons await my next click - "Extract all info" or "Save to tree." Clicking "Save to tree" I would expect that the only thing that would be copied to my tree would be the one photo. Let's do it. The "Review Match" screen appeared along with a confirmation of when I confirmed the match. Just below her picture, I am going to click on the "View in Tree" link. Just like that, her picture now appears in my private online tree. MyHeritage did a good job of correctly presenting me with a possible match to Fanny. If I ever wanted to, it appears to be very simple to copy information from another tree to mine. Yet is the ease of copying going to contribute to the duplication of inaccurate trees? I am still going to treat data like this as clues and follow up with solid genealogical research. I will always be a believer that someone else may hold a missing piece of my family's puzzle and so I continue to believe that it's okay to look at others' trees. In each step, there was a link to contact the submitter of the information. If I am looking to get in touch with a submitter, it seems to be pretty simple. The email I received showed 45 possible Smart Matches. Clicking on the "Matches by People" option of the Discoveries menu shows that MyHeritage has been busy since they sent me the email. I don't know whether to be excited or overwhelmed by those numbers. Keep in mind, I uploaded my entire tree - my side, my wife's side, ancestors that I'm not currently researching, ancestors that I think about every day. Wondering if I could narrow the matches down, I clicked on the "Sort by" menu and then clicked on Relation. This is where things started getting, in my kids' words, "sketchy." Among the first Smart Matches, when sorted by Relation, was my grandmother! It showed that there were three matches. How could there be Smart Matches to my grandmother, who is alive, when I thought my tree, and the living people in it, were private? This shows that Grandma is a Smart Match to someone in the "Fjeldsted Web Site," the "Reed Web Site," and the "McCall Web Site." Clicking on the orange Review Match buttons definitely shows that Grandma does appear in these other websites as a living person. Her personal details and the personal details of her children are there as well. This is where I became concerned with the privacy. What are Smart Matches™ and how do they affect your privacy? Smart Matches™ is a technology developed and owned by MyHeritage to find matches between family trees, by looking for individuals that they have in common, and bridging across differences in spelling, phonetics, facts and languages. Smart Matches™ are very useful in that they facilitate discoveries of unknown relatives and reuniting families whose ties have been disconnected over time. Other MyHeritage users may receive notifications regarding Smart Matches™ between individuals in their family tree and individuals in your family tree. Smart Matches™ may also be found on living individuals in your tree. If you are concerned about the privacy of your family tree, to the extent that you do not wish to allow potential relatives to find and view parts of it, you can disable Smart Matches™ for your family tree(s). See "Privacy Preferences" below. By default, Smart Matches™ are enabled. It is very rare that we have people concerned by this, and their remedy is to turn off the Smart Matching. When others cannot match with your tree, you too do not get matches with other trees, so 99.99% of the people prefer to keep it enabled. The ability to match living relatives is very helpful, because many discoveries and family reunions happen that way. btw, if the other user didn't have your children in his tree already, he won't see their details in a Smart Match, to protect their privacy. If he does have them in the tree, he is very likely related to you, and he knows about them already, and in that case hiding information such as their age defeats the purpose of having matches. So these three other trees in which my grandmother was listed as a Smart Match already had the living details about my grandmother and her children. So like MyHeritage wrote, they are likely close relatives, and someone I would probably actually want to communicate with. And if they did not already have the private information about Grandma, I never would have matched to their tree anyways. Without this explanation, or the careful attention to the explanation of how their Smart Matching works, some may be concerned, like I was. In my opinion, this is actually very good technology, and like they said, if it bothers you, you can easily disable Smart Matches. I also learned that while browsing the tree in the chart mode, you can tell if a person has Smart Matches if they have a little green icon. Just give it a click and their list of matches appear. For the first "official" time ever, I'm announcing here that the soon-to-be-released Legacy 9.0 will have built-in hinting. Instead of going out to sites like FamilySearch, GenealogyBank, or even MyHeritage, Legacy will do the searching for you! Above, Jeremiah Brown's new Hint icon shows the number of 9+. Clicking on it shows 39 hints from MyHeritage, 23 hints from GenealogyBank, and 1 hint from FindMyPast. Clicking on each one will present the results. While I could go visit each site each month on my own, Legacy is using some pretty advanced logic to find results that you may miss on your own. Coming soon to Legacy 9.0! This post was a little longer than I intended it to be, but I think I now have a good grasp of the ins and outs of MyHeritage's Smart Matches tool and like what I see. Coming up next, I will report on the second of the seven unique technologies from the MyHeritage webinar - Record Matches. Stay tuned. The most comprehensive beginning Irish genealogy course available online just got better. Originally a 6-class series, the course has now been extended to twelve classes. It is taught by the foremost Irish genealogy authority, John Grenham. He is the author of the definitive Irish genealogy guide Tracing Your Irish Ancestors. The now twelve-class series introduces you to Irish genealogy and then progressively takes you through the major Irish records sources. Taught with humor and an authentic Irish accent, Grenham brings together Irish research in a way only the most knowledgeable Irish researcher can. He was Project Manager with the Irish Genealogical Project from 1991 to 1995 and later went on to develop and market his own genealogical software, 'Grenham’s Irish Recordfinder'. He ran the Irish Times/Irish Ancestors website from 1998 to 2016. It now runs on his own site. In 2005, he was the first Genealogist-in-Residence at Dublin City Library and Archive. He is responsible for developing most of the heritage databases on databases.dublincity.ie. He was awarded a fellowship of The Irish Genealogical Research Society in 2007 and of the Genealogical Society of Ireland in 2010. Among his publications are the standard guide to Irish genealogy, Tracing your Irish Ancestors (4th ed.2012), Clans and Families of Ireland (1995),Generations (1996), “The Genealogical Office and its Records” in The Genealogical Office (1999), Grenham’s Irish Surnames (CD-ROM, 2003),The Atlantic Coast of Ireland (2014) and numerous articles and columns in the UK magazine Your Family Tree. He wrote the “Irish Roots” column and blog in The Irish Times between 2009 and 2016. The blog is now at www.johngrenham.com/blog. In 2011 and 2014, he was co-presenter of the Irish television show “The Genealogy Roadshow“. In 2014, 2015 and 2016, he delivered a ten-week diploma in family history course at City Colleges in Dublin. All twelve of these classes are bonus classes in the webinar library. The webinar previews are always free for non-members to watch. Because of the destruction of almost all 19th-century censuses in 1922, census substitutes have taken on an unnatural importance for Irish research. This talk gives an overview of the range of records involved, moving along the spectrum from things that are somewhat census-like to strange beasts that are nothing at all like a census, but still highly useful. The usefulness of Irish newspapers as a research tool has been completely transformed by digitization. The talk outlines the main geographic areas covered by newspapers since the 18th century and provides a guide to online access, as well as some very useful offline sources. Both of these sources concern those with at least some property to their name, and both are now much easier to search online. The talk details relevance, locations and access, online and offline. Since 1704, the Registry of Deeds in Dublin has been providing legal registration of property transactions, often recording precious extended-family information in the process. The LDS Family History Library has a full set of the records up to 1929 on 2686 microfilms, but they are woefully misunderstood and underused. The talk covers the nature of the transactions, the individuals involved and the main routes of access, with examples and images of the records. This talk also covers the Genealogical Office. Griffith's Valuation is the best-known 19th-century Irish census substitute. But the published Valuation itself is only the tip of the iceberg. Before publication, a huge surveying operation produced mountains of documents, most now available online, and after publication revisions were produced continually up to the 1980s, providing an excellent source of information on possible living relatives. The talk details the creation of the records, their locations and access, online and offline. An overview of the most important occupational sources for Irish genealogy, with a large part devoted to the records of Irishmen in the British Army.